Notes: 248 pages, 25x28 centimeters (landscape), Hardbound, over 300 images and maps. Some period color photos. In the decades since the end of WWII, there have been literally tens of thousands of books published on the subject. They are a wide variety of subjects and styles varying from scholarly works to those that have been, well, embellished to make them more exciting. One thing that they have in common is that they are, for the most part, about combat, pure and simple. It is combat that draws many to read these works for this is the part of war that draws the greatest interest. However, the majority of those who served were not on the front lines. The army (or navy or air force) does not operate on combat personnel alone. Behind or very close to the lines are those who are an equally important part of the logistics of going to war. Their job is no less important and often times these folks are just as much in harm's way, but without the means of fighting back. This brings us to this book by Axel Urbanke and Hans Becker. Hans Becker was one of the many who pretty much served behind the lines. He was a clerk at a headquarters company and spent most of his war doing the administrative tasks required by any combat unit. He was attached to panzer regiments and operated out of an omnibus, which were the best way for a unit to have an 'office' as it were. These could be placed near the front lines, but not so near as to be easily over-run. Hans Becker was also an avid photographer and of such skill that he easily got the permission of his commanding officer's to document their unit for their war diary. Thanks to this lucky combination of a non-combat soldier, a skill at photography, the permission to take photos and the survival of his film, we have what has to be the best look I've ever seen of what it was like to live and work near the front lines. After serving in occupied France working for people that treated him poorly, Hans Becker was able to get a transfer to the Afrika Korps in time to participate in the lead up to and the aftermath of the battle at El Alamein. Following a BV-222 ride to Tobruk, he joined 8 Panzer Regiment. All the time, he took photos. Nice, clear, and sharp, these photos grace page after page in the book. What makes the book so much better than just photos are inclusions of his letters home as well as the general flow of events from the official records of the unit. Wounded in the retreat near Tripoli, Becker spent time in hospital before being assigned to Panzer Abt. 508, which was formed in France to work up on the Tiger tank. Such was the pace of the war that his unit was quickly sent via rail to Italy to help stem the tide of the Allied advance in general and the landings at Anzio in particular. It is with this unit that Becker remained until the end of the war. Not only are his letters and the historical background a fascinating read, but the photographs are the real treasure in this book. 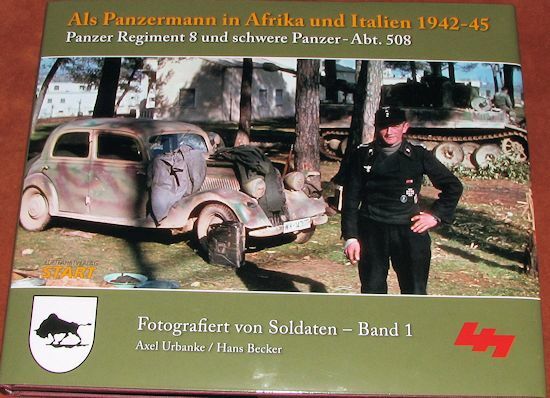 They are clearly done and provide photos of not only Becker and his colleagues, but the equipment they used, the places they visited, and how they lived near the front lines. We see vehicles that are rarely photographed, tanks being repaired and knocked out enemy vehicles. What is even more of a treat are the dozens of full color photographs that he took during his time in Italy. An example of one is the cover of the book. It makes for a quite unique look at things and sheer 'eye candy' for those who are interested in the German side of WWII. It is a book that I can quite easily provide my highest recommendation. It is one that is sure to sell quickly so I encourage you to get yours while you can.